12 Piece Plastic Dinosaur Set Only $7.90 + FREE Shipping! You are here: Home / Great Deals / Amazon Deals / 12 Piece Plastic Dinosaur Set Only $7.90 + FREE Shipping! Do your kiddos love dinosaurs? 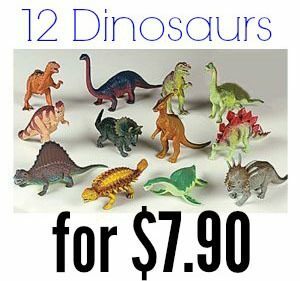 Then, you’ll want to check out this fantastic deal – get this 12 Piece Plastic Dinosaur Set for just $7.90 + FREE shipping! That’s just $0.65 per dino! This wet would make a great gift for your kiddo or would be great to grab for party favors!